Chargers fans and fantasy owners haven't been too thrilled with Melvin Gordon's output. Melvin Gordon was at the tail end of a 32-touchdown campaign this time last season. Wisconsin feels like so long ago now. 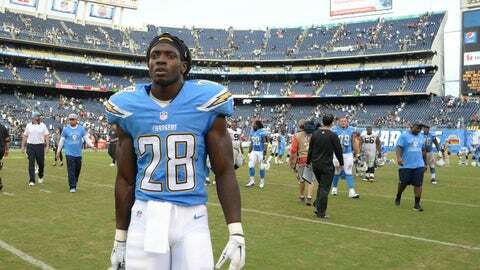 He's gone 12 weeks without a score so far as a Chargers rookie. Gordon has had the most touchdown-scoring chances, from a statistical standpoint. His 170 total touches put him first among NFLers without a touchdown by a solid margin. The painful streak kept going last weekend in Jacksonville. In the second quarter, San Diego rode their rookie down to the Jaguars' two-yard line on back-to-back red zone runs. Philip Rivers passed for the touchdown instead. Then, in the fourth, Gordon broke through with a promising fourth-down carry. It on a shoestring tackle, not a touchdown. It's only a matter of time before the drought ends — but a touchdown-scorer like Gordon must feel its pain with each passing week.